The map and route. We followed it counter-clockwise, but it can be done in either direction. Click to enlarge. There’s snow up high and it’s kind of blustery out. Late fall has arrived to the mountains, it’s time to go to the desert. When last weekend’s weather forecast wasn’t looking conducive to outdoor activities around Aspen, Christy and I decided to head to Moab. Hardly a secret getaway for the time of year, an October weekend there can feel as crowded as Aspen over a holiday. 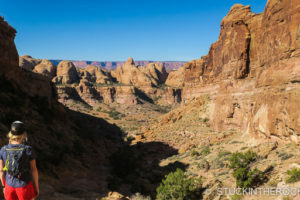 So while the decision to head to Moab was easy, the call as to what specifically to do and not find ourselves amongst the throngs wasn’t as clear. 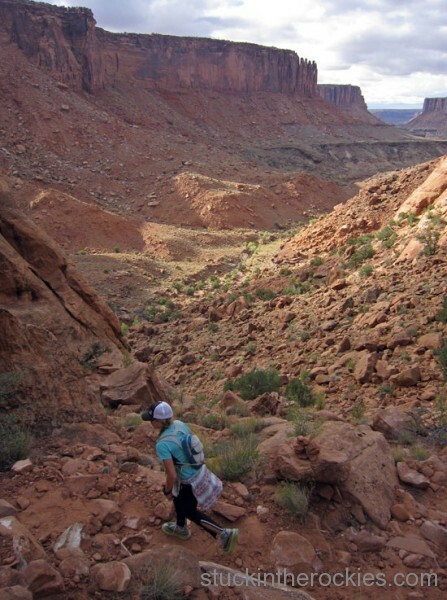 Christy heads towards the “alcove” of the Alcove Spring Trail as we descend from the canyon rim. 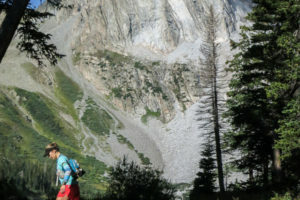 We planned to run one day and ride one day, and after pulling out some maps to consider some options, one loop in particular showed potential to be both new to us, and off the beaten path. It’s really pretty simple. 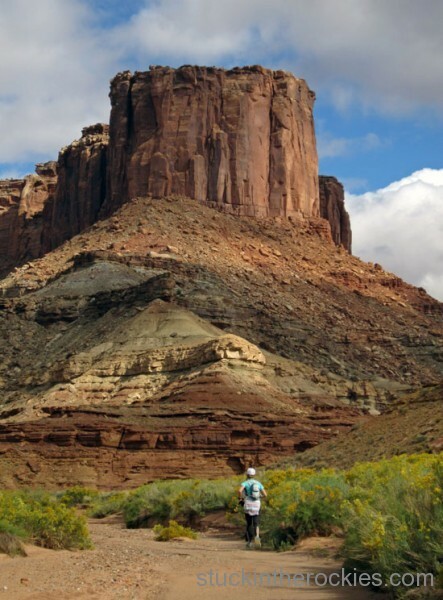 From the north end of the Island in the Sky district of Canyonlands National Park, run down the Alcove Spring Trail towards Taylor Canyon and the spires of Moses and Zeus. Follow Taylor Canyon down towards the Green River, to where it connects with the White Rim Road. 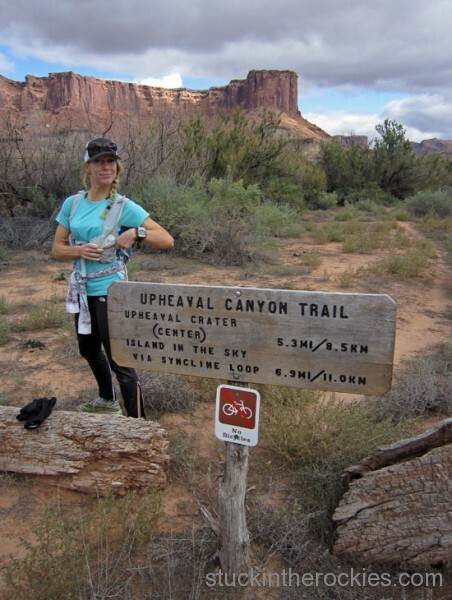 Head south on the road for a short bit to the Upheaval Trail, and run up the wash towards Upheaval Dome. 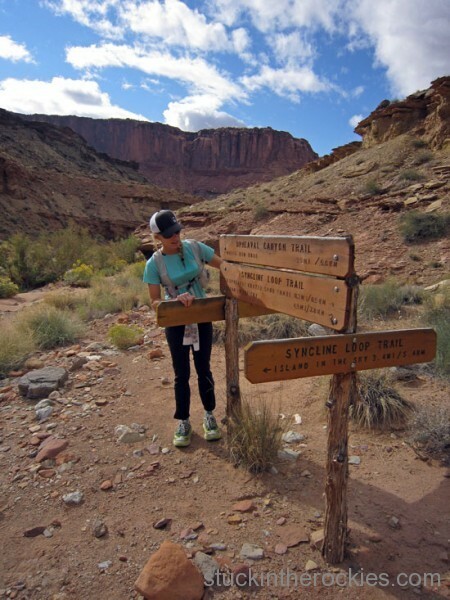 After a few miles, you’ll come to a signed intersection where you follow the south side of the Syncline Loop Trail, back up to the parking area at Upheaval Dome. Once down from the rim, follow the wash down the canyon. 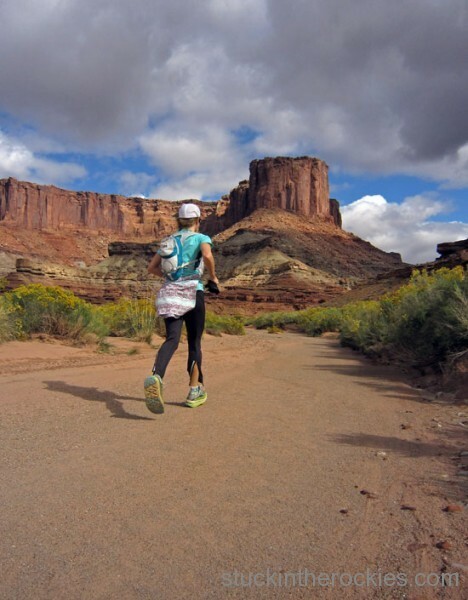 You’ll be about one mile from the Alcove Spring Trailhead, so either shuttle back to the start when you’re finished, or run the one mile on asphalt as a warm up in the beginning, as we did, and don’t deal with a shuttle at all. As for stats, the round-trip distance (with the paved stretch at the start) was just under 20 miles, and taking out for breaks, it took four and a half hours. We saw one backpacker on the Syncline Trail, and three people at the Alcove Spring Trailhead, so I think it’s safe to say we did a good job avoiding the crowds. We took a break near the confluence with Taylor Canyon Wash. Evidence of recent flash floods that swept through the area can be seen in the foreground. Poor little guy. 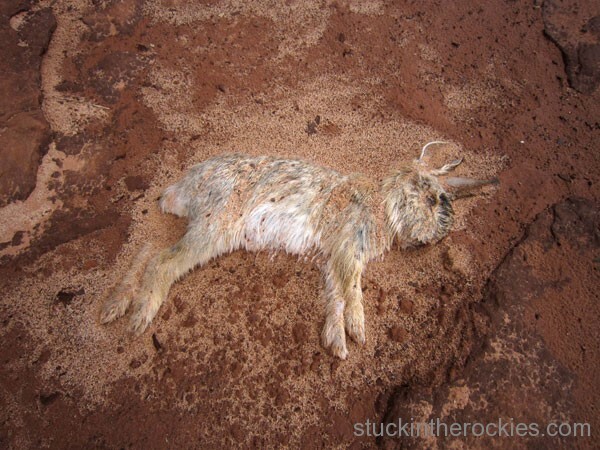 We imagined the water swept him away as he bounced home to his burrow after some big party up by Zeus’s Spire. He probably never knew what hit him. 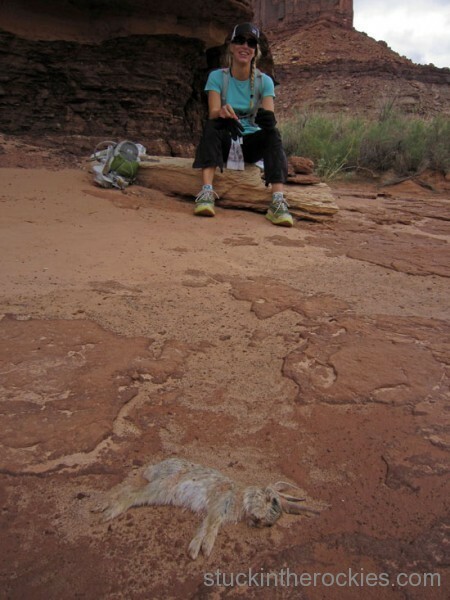 After a moment of silence for the poor bunny, we started down Taylor Canyon, passing by Zeus and Moses. 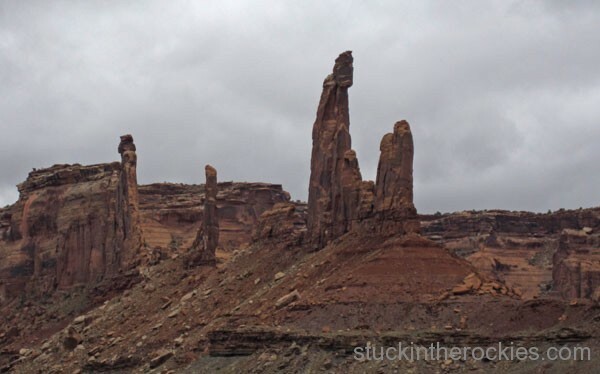 About six miles later, we made the turn off the White Rim Road, and we were on our way home. 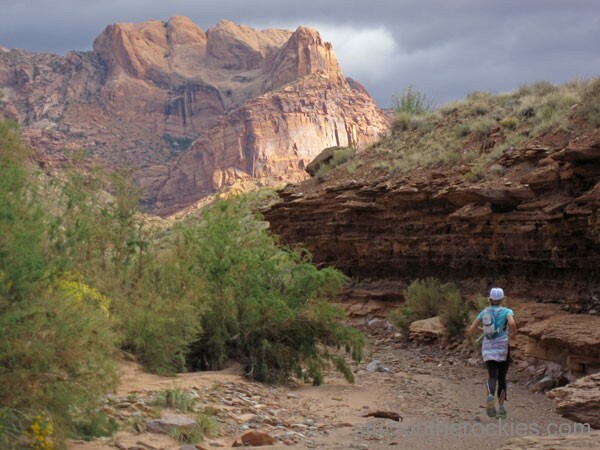 Motivated by a cooler full of beer, it’s up the Upheaval Canyon Wash from here. A short way further, the lumpy rim of Upheaval Dome appears. Though the map says the trail follows the wash to the south, the signed trail junction with the Syncline Trail Loop is almost in the wash itself. Eventually the cairned trail steepens as you ascend to the rim. The Green River and White Rim Road are way out in the distance. The elevation profile. 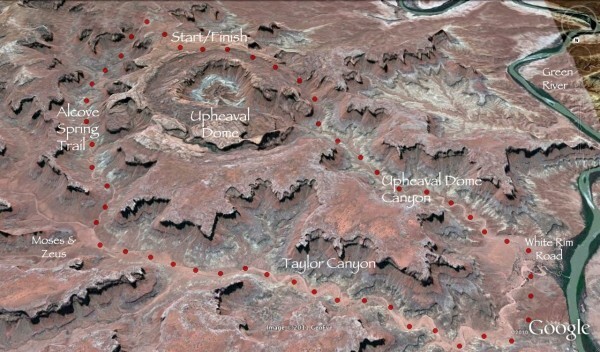 The walls of the canyon briefly blocked the GPS signal at the beginning, and left an erratic down and up on the chart which should be disregarded. The Upheaval Dome Crater, as seen from the 1st Overlook, click to enlarge. Great idea! 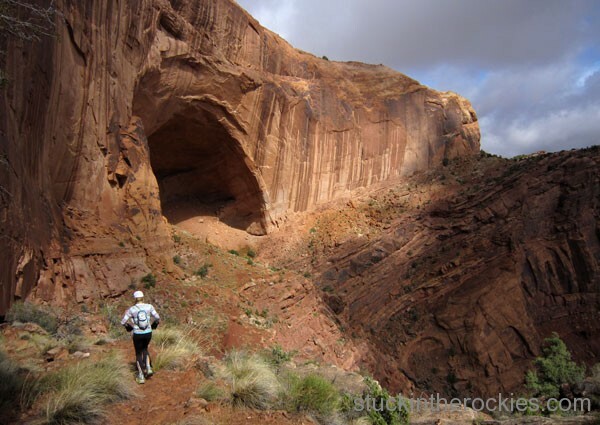 What is the elevation profile like – is it rolling ups and downs, relatively flat, steep pitches, etc? Thanks! Andrea, I added an elevation profile to the post. Basically it’s downhill from the rim and then uphill back to the trail head, but more specifically, it’s steeper for a mile or two at both ends, and is pretty flat down in the wash’s. There are some small rolls to go up and down along the way, and sometimes when you cut a corner out of the wash you climb up and then drop back down, but as for net changes, it’s down, then up. And where it’s steeper, the surface is generally worse and less conducive to running. 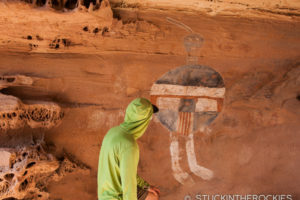 Sometimes the wash was firm sand, but once in a while it would be unsorted rock which sometimes required a walk. But all-in-all it’s very runnable. Fry, we had an overcast day around 60 degrees so the sweat factor was pretty low and the shrimps were kept at bay. I’m sorry you had to lug a case of beer up there. I would have thought there’d be a place of refreshment up there.